In the White Room at IAC an Acousmonium – a loudspeaker orchestra of 42 loudspeakers – will be set up. 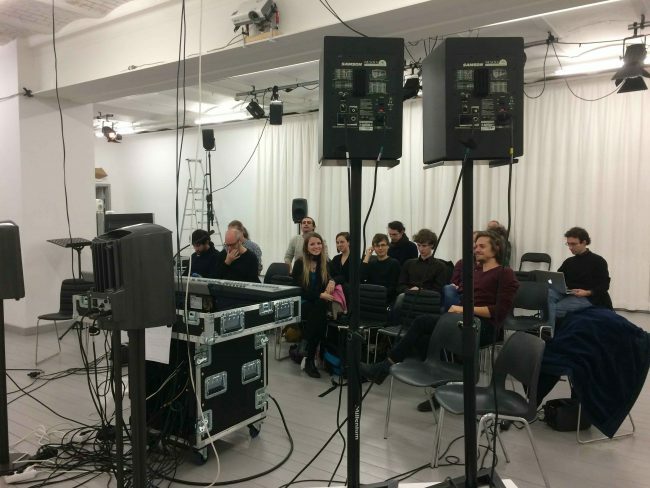 For one month we will have a sharpened focus on experimental practice within the acousmatic art form. Instructors: Jakob Riis, Kent Olofsson, Alessandro Perini and Fabio Monni. La Creation Du Monde is a large-scale piece, by the french composer Bernard Parmegiani. Sound diffusion by Alessandro Perini, Fabio Monni and tba. Mats Lindström will present his composition Low Fidelity, (Låggradig naturtrogenhet) from 2016, playing electronic instruments and equipment built by himself.